Women with disabilities face many barriers to their right to equal participation in Canadian society, including to their rights as parents. Advocates and women with disabilities report that as a result of misconceptions and biases about disabled women’s capacity to parent, many women with disabilities face discrimination and violations of their equality rights as mothers. There is limited research in Canada around these issues. This project was developed to address this gap. Mothers face unique challenges stemming from barriers associated with both gender and disability. For example, women with disabilities may lose their children through custody disputes or child protection proceedings because of misconceptions about their ability to parent, detrimentally impacting the rights and well-being of both mothers and children. The experiences of women suggest that prospective mothers face obstacles trying to exercise their reproductive rights or access reproductive technology. 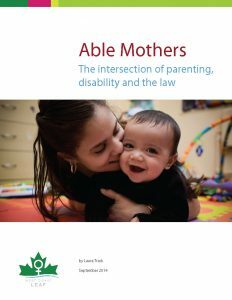 There are a number of other areas in which mothers with disabilities may face particular challenges in their interactions with the law, including in the contexts of adoption, immigration, employment and other areas of law and policy. 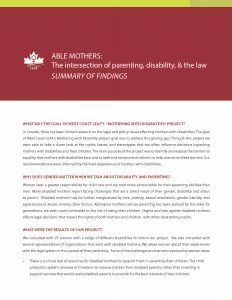 Our goal with this project was to identify systemic barriers facing mothers with disabilities in BC through community consultations and legal research. We aimed to analyze the ways in which existing laws and policies apply to women with disabilities and in turn, to recommend necessary changes to ensure greater respect for the rights of mothers with disabilities. We collected qualitative data through interviews with mothers with disabilities and service providers who work with them, and then drew on these stories to identify key policy issues on which we conducted legal research. The findings were presented in a report to policy-makers on the law and policy issues impacting the rights of mothers with disabilities, which included law reform recommendations.